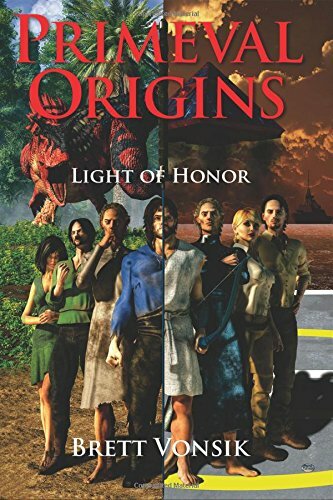 Article first published as Interview: Brett Vonsik – Author of ‘Primeval Origins: Light of Honor’on Blogcritics. Brett Vonsik created the Primeval Origins epic saga after more than 25 years of research into mankind’s oldest mythologies and creation myths, the stories and messages in the Bible and Qur’an, and findings in modern sciences and forbidden archeology, all melded into a single storyline. Learning of the world’s many cultures and beliefs in his travels as a United States Air Force Special Operations aviator, Brett blends these experiences into his characters, settings and action. When not working on Primeval Origins, Brett works at his day job in industry, spends quality time with his wife, family, and friends on his homestead, and enjoys the Florida wild outdoors that provides an uncanny resemblance to the cretaceous world of Primeval Origins. Sheri: Welcome, Brett, and thank you for joining us today. Why don’t you start by telling our readers a bit about yourself? Brett: I’m a military veteran of the United States Air Force who married my high school sweetheart, Alison, the most wonderful wife a man can hope to be blessed and privileged to have in his life. I have two just as wonderful children – both having flown from the nest and married; a talented angel of a daughter and a son who is a pillar of integrity serving as an officer in the United States Army. By day I work as a mild-mannered systems engineer in the simulation and training industry. By nights, weekends and any other time that allows, I research, create and write about the Primeval Originsuniverse. I enjoy the outdoors, scouting and hunting mostly, though fishing presents its own sense of enjoyment and provides time to think on matters of life, politics and the cosmos. Sheri: What inspired you to become a writer? Brett: I’ve always had the itch, even as a teenager, but early on found other things more important than writing. In recent years, I’ve amassed so much information concerning humanity’s history – both that which is accepted in academia and that which is controversially emerging with new discoveries, our many mythologies and their stories of creation, our major religions and what they speak of concerning morality and end-times judgments, and new developments in the sciences – physics, geology, paleontology, archeology, and many others. As a good systems engineer looks at an entire system, and how all the parts make the whole, I found all of this information fit together as pieces of a massive jigsaw puzzle telling an undiscovered or maybe better described as an untold story of our human existence. This jigsaw puzzle, the societal turmoil and political struggles we’re undergoing now, in our present civilization, appear not entirely as isolated acts nor random accidents, but as an outcome of the collective choices made by humanity…free will…that is possibly guided by unseen hands. It is this jigsaw puzzle getting filled in with each new piece of discovery that made me wonder at the purpose and meaning of life and humanity and what IT is all about. It is this undiscovered…unacknowledged and untold story that inspired me to write Primeval Origins. Sheri: What is Primeval Origins all about? Brett: Primeval Origins is a story about humanity’s and individual responsibilities in our allowed free will, our moral and immoral intents, and the consequences to one’s and collective choices…all judged by a standard made by Creation. The Primeval Origins story is wrapped in an origins story of the major players in the Bible’s and Qur’an’s end times prophecies, described through a telling of the humanity’s oldest creation myths. It is also a story about the weigh and measure of our Light…our Spirits…Souls in the conclusion of this, humanity’s 5th Civilization. It all comes down to something simple, yet elegant in its grand design…are we creatures [humans] of only flesh or of Spirit? If of only flesh, then what is the point attempting to behave with good intentions and morals? If only of flesh, we’re no different or more important than the chemical reactions in the rocks, water and atmosphere of earth. In all of this amassed knowledge that inspired me to write, it is the realization that we are creatures…beings of Spirit, joined with flesh to be matured and tested of our morality in a final judgment for purposes grand and integral to the universe and Creation, God. Sheri: Where did you get the idea for Primeval Origins? Brett: My curiosity in our ancient myths and legends started while I was cadet at the United States Air Force academy where, as a captive cadet not allowed to leave the institution’s grounds except on the rare occasion, I played with friends the roleplaying game Dungeons and Dragons. It was from this game that our mythologies sprang forth into the context of play that teased and compelled me to seek more details…the more primeval the origins of the myths the more interesting they became. Patterns formed. The jigsaw puzzle started to take form. I never stopped seeking more truths. In these latter years, my friends and family discussed what I found in my research of the past two and half decades. I’ve put together a detailed history, thousands of years, leading up to our original mythical Creation stories…the Sumerian, Egyptian, Hindu and other myths of humanity all melded into one story. They all fit together when you look as them closely. “This is one hell of a story…unlike anything I’ve ever heard of in books or movies.” Exalted a friend who I’m now in business with producing this story. We formed Celestial Fury Publishing to publish this and other stories in multiple media forms. For Primeval Origins we look to this multiple media format to tell both the main and back-stories, the books making up the backbone of the main story, the graphics novels and potentially other books to reach different segments of fans with back-stories telling more of individual characters and events. We looked to self-publishing through Print-on-Demand (PoD) so we can maintain control of this complex, integrated story. It’s a rougher road to travel than getting an established publisher to produce who would likely demand “changes” as they see fit. An established publisher producing PO, as we call Primeval Origins internally, would make punching into the mainstream distribution and marketing engines a lot less painful, but we feel we would have to “sell our souls” and the integrity of the PO story to do so. The self-publishing PoD path is one requiring both time and financial sacrifices on our parts. Despite the sacrifices, we are committed to bringing the Primeval Origins story to the world. We, and others who have joined us, have a plan for Primeval Origins that goes beyond just the printed formats. More on this in a future revealing. Sheri: What can you tell us about the latest book in the saga: Light of Honor? Where does it take us from the first book, Paths of Anguish? Brett: Primeval Origins: Paths of Anguish introduces the format of the telling…both of the First and of the Fifth, the last, Civilization of humanity. It also introduces the ancient characters deeply involved in our future end times…Rogaan, Aren and Ezerus and the characters of our future, Nikki and Anders. Nikki is the bridge between past and future having suffered an accident that links her to these ancient beings. We learn that Rogaan is a young Tellen that aspires to be protector warrior of his town, but struggles with acceptance of his desires by both family and the town’s folks. He’s thrust into a much larger struggle in book one, blundering his way through events that are controlled by others. Nikki too is thrust into a cosmic struggle she could not have imagined as she discovers on a dinosaur dig in South America ancient technologies that should not exist and of the three ancient people that she becomes linked to. She suffers reliving their memories. Book two, Primeval Origins: Light of Honor sees Rogaan begin his transition from blundering pawn to determined actor in his story. Book Two also introduces Aren into the ancient story, as a lost and confused young Evendiir with untold potential in the use of Agni powers. The future story in Primeval Origins: Light of Honor brings all the characters together in an epic struggle to survive the tyrant hands of forces integral to the coming apocalypse. Rogaan and Aren are formidable, but not yet to their full potential that will be revealed in future books. Nikki begins understanding her link to and the personalities of Rogaan and Aren. She still is not aware of her significant role to play in future events as she finds a growing comfort in her relationship with Rogaan and Aren. Hints are peppered all through both books of what is to come, including the reflections of a mystery character of epic importance, the Harbinger of Judgments. This telling of Light of Honor raises Primeval Origins from a mere epic fantasy story to one of a cross genre epic fantasy / science fiction opera based on my amassed findings forming the jigsaw puzzle of humanity’s undiscovered and untold past. Sheri: Our reviewer, Paige Lovitt, says the series is “…destined to be recognized as a classic.” That’s high praise! How do you feel about that declaration, and what do you think qualifies a book or series to become a classic? Brett: Exceptionally high praise that I am blushingly flattered to receive. I’ve attempted to tell the Primeval Origins story in a manner that would do justice to those stories I’ve enjoyed most: Elric and the Eternal Champion, Conan, “Lord of the Rings” and the “Wheel of Time”. I studied what made me like these tales and have done my best to create characters that are alive with motivations, faults and desires, and to write in a descriptive way that readers can experience the lives of the characters. I also studied the way our modern movies move the story forward with a lot of teasing in hints of things to come. I’ve blended all of this together in what some family and a couple of review critics describe as an unorthodox style of story-telling and writing. After all my style studying, I set off on a ten-year struggle to develop my writing and story-telling style. I wanted to like what I wrote before I would dare suffer others to my prose of story. Then came the big moment with the first formal review of Paths of Anguish by Outskirts Press, when they screened the book in their quality check to determine if the book would be able to be published without significant work by editors. “Your book reads like a movie,” they informed me. Then, the first formal review with grading by Readers’ Favorite of my published book in the summer of 2014 – 5 STARS! I had that Tony Stark moment in the movie Iron Man, ”Yeah, I can fly.” I can write, I realized. What do I think qualifies a book or series to become a classic? One that is well written for readers to enjoy the depth of the characters and has a deeper moral story than a telling that merely races an action filled plot along seeking to wow readers with bigger “explosions”. I will do my best to live up Paige Lovitt’s praise. Sheri: How did you arrive at the decision to publish Primeval Origins as an independent author? Brett: The Primeval Origins story is too complex and integrated for a publisher seeking another following the format of what is popular. I don’t follow trends. I’ve always taken the less traveled path of leading with anticipation of what can be. My partner in publishing spent three years with me at lunch discussing Primeval Origins and how to publish the story before we formed Celestial Fury Publishing. He asked me “How much?” I was confused at his question. “How much will you sell this story for?” He asked me, again. He then started dropping numbers on the table…big numbers. I told him I would not be willing to sell control of the story, as I believed Primeval Origins had and has great potential once the spark is lit in a fan following. He said, “I’m in.” That’s how the decision was made to publish as an independent author. Sheri: What specifically do you hope to inspire in your audience with the Primeval Origins series? What do you hope is the biggest “take-away” from your writing? Brett: Curiosity. Curiosity to spark in readers the same desire as I had to investigate and research our ancient myths and legends, the unceasing flood of new discoveries in all the sciences, and most of all to read the Bible and to reflect what it is to be human and maybe more. Sheri: What’s next in the saga? When can readers expect the next book? Brett: Books. More revealings of how our angels and the actors of Revelations came to be, the importance of Nikki and Anders, and the intervention of the Harbinger of Judgments into future affairs on behalf of humanity battling those who have fallen. Sheri: Do you have one piece of advice you received that marks the turning point in your writing career? Brett: Not so much concerning my writing career, but of life in general I received three pieces of advice. The first was from my mother so many years ago, “You can do anything you set your mind to.” The second was from an uncle, “What you make of your life is an act of shear will.” The third was from a successful senior military officer when I was in the Air Force, “If you want to be successful, build a trusted team. Alone, you can only climb so far.” When you look at those who are successful in whatever they do, you find these bits of advice flashing brightly in their actions. Sheri: What advice can you offer aspiring Fantasy authors? Brett: Seek to tell a unique story filled with characters that can be believed by the readers. Sheri: What do you like to do in your free time – if you have any, that is? Brett: Spending time with my wife, daughter and son. Time on the gun range, hunting, fishing and enjoying nature with family. Sheri: Do you have a blog and/or website where our readers can follow and correspond with you? Brett: Yes. First, we have the Primeval Origins website at www.primevalorigins.com where the PO Lexicon and Encyclopedia exist so we can put all the stuff that can’t fit into the books for the readers to reference. The website also has the latest PO news and the store where fans can ask for an autographed copy of the Primeval Origins books. Second, we have a robust Facebook site at www.facebook.com/primevalorigins. So far, over 15,000 Likes have been registered. We’re presently setting up a Twitter, Pinterest, and Instagram presence. We’re looking to be at MegaCon and several other conventions in the Southeast region of the United States this year and beyond. The Primeval Origins Epic Saga video clip on YouTube (https://www.youtube.com/watch?v=hsjhitgMQAw) provides a great introduction to the story. A blog is coming, but right now, I’m spending time writing books and keeping up everything I just identified. We also have some other spin-offs of Primeval Origins occurring in the Orlando, Florida area. A less traveled path of leading with anticipation of what can be. Brett: Buckle up! Enjoy the journey. We’re just getting started. Sheri: Brett, it has truly been a pleasure having you with us today. Thank you so much for stopping by and giving us some insight on your epic saga. I look forward to seeing more work from you in the future. Brett: Thank you for having me.